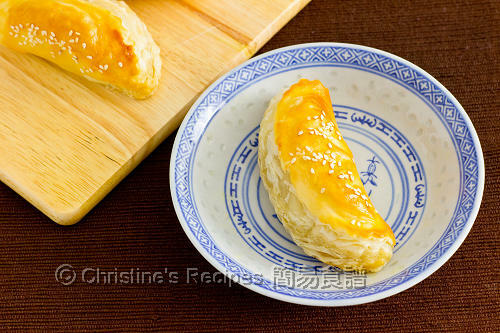 Char siu pastry (aka char siu sou, 叉燒酥 in Chinese) is easily found at Chinese yum cha restaurants in Hong Kong or overseas. 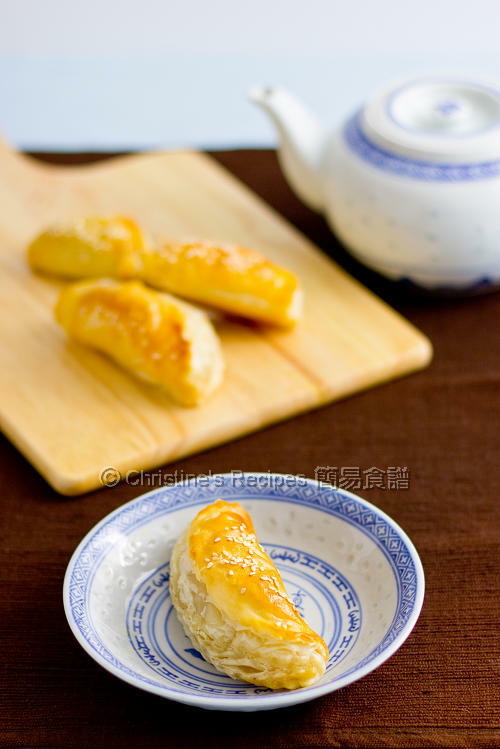 The juicy char siu (BBQ pork) is wrapped inside flaky pastries made with lard or shortening. You can tell how delicious and awesome the pastry will be. My daughter is a big fan of any dishes made with puff pastry, no matter it’s savoury or sweet. Sweet dessert with pastry is her first choice without any doubts though. As for making these char siu pastries, I took a short cut using the store-bought puff pastry and came up with a cheater’s version. These char siu pastries are perfectly served when they’re still hot, with a cup of favourite Chinese tea. Heat oil in a frying pan. Sauté the shallot over medium-high heat until aromatic. 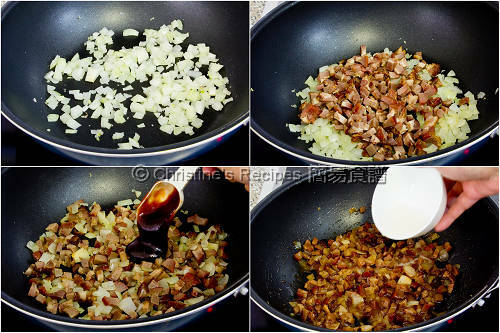 Add the onion and cook until soft and translucent, followed by the diced char siu. Stir in the char siu sauce with the water. Cook until it starts to boil. Add the thickening and cook to your preferred consistency. Transfer to a large bowl and let it cool down. Set aside. Preheat oven to 200C / 395F. In the meantime, lightly sprinkle flour on a clean surface. Roll out the puff pastry into a 32cm x 22cm ( 12.5inch x 8. 5inch) rectangle sheet with a rolling pin. Use a 10-cm (4-inch) cookie cutter to trim out 6 circles. Place a heaped tablespoon of char siu filling in the middle of each circle. Damp the sides with water and seal tightly. Repeat this step with the remaining fillings. Carefully transfer the char siu pastry on a lined baking tray. Lightly brush egg wash on pastries. Cut 2 to 3 slits in the middle of each pastry surface. Sprinkle sesame seeds. Bake in the preheated oven for about 15 to 20 minutes, or until golden brown. Serve hot. You can get puff pastry block from supermarkets. To get the best results, transfer the frozen puff pastry from freezer to fridge overnight before using. Then place it at room temperature for about 15 to 20 minutes. If the weather is warm, the time might be shortened. Just wait until the dough is workable for rolling out. Don’t wait too long though. You can make your own char siu (Here’s BBQ pork recipe) or use the ready-made from Chinese BBQ shops. The pastry can be cut into different shapes as desired. Christine, this is my mum's favorite too. I will try this soon. 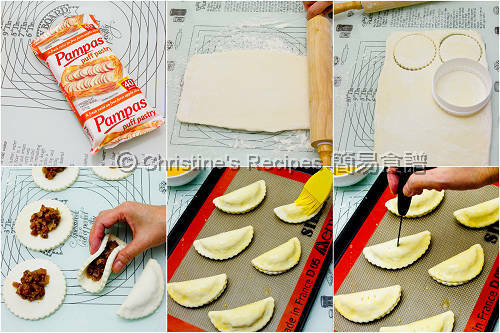 Christine, can I use puff pastry sheet instead of puff pastry block? Sure, you can use puff pastry sheet. You'll get thinner pastry. Hi, thanks for posting all these recipes! I was just wondering if you know how to make the pastry dough from scratch and not use store bought ones? I like store bought puff pastry. It's handy and save a lot of time of making it. I make malaysian curry puff using the same store-bought puff pastry.